Living Histories offers a unique range of courses and workshops. Below is just a sampling of courses & programs we have offered over the past decade. All courses are customed designed to meet the specific need of the community we are working with. Though some classes are designed for certain age groups, generally, most programs can be developed for any K-12 or adult setting. Likewise, most courses can be taught for any length of time, ranging from a full semester, or a single day long workshop. All classes utilize project based learning. For our current class listings (produced at the start of each fall, spring and summer) & pricing, please contact us. We are well versed at creating 'maker spaces' at all sorts of locations, as well as facilitating programing that best utilizes the space, encouraging problem solving, creativity and critical thinking. Encourage your students to think like a designer! An emphasis on problem solving, collaboration and brainstorming. This is a broad curriculum that is ideal for introducing students to the LH model, with a variety of lessons that appear in other curriculum with the goal of emphasizing community and teaching art skills. A curriculum that looks at the art used by native cultures around the world, with the service project being connected to indigenous rights. Looks at art from around the world, seeking common themes and ideas. A curriculum geared for older students that emphasizes each individual’s own unique creativity and outlets for that creativity for the better good. A curriculum that explores the use of mandalas as a means of self expression. Looks at different forms of the idea of a ‘self portrait’ and self-expression. Teaches students fun, hands on Do It Yourself graphic design projects. A class that focuses on the video and photography mediums. A curriculum that teaches poetry and lyrical writing and connects it to other art forms. A curriculum that studies the history of narrative from various cultures – indigenous, quilt makers, etc – and cumulates with students conducting oral histories and documentary photography of their own communities. A curriculum that emphasizes the use of comics for storytelling and expression. 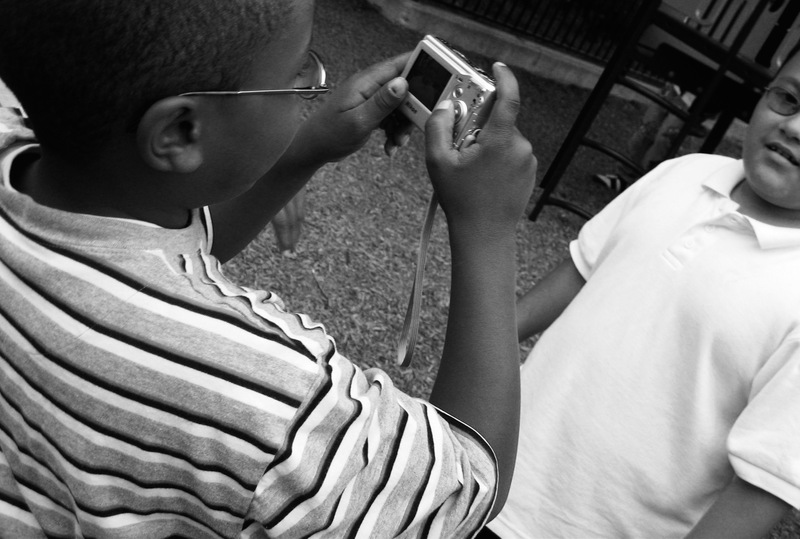 "Digital Storytelling capturing and recording our lives and community"
This course allows students to use photography, video and blogging as a means to explore storytelling and the documentary form. A class that teaches concepts about community organizing, the legislative process, outreach and marketing. Geared towards older students. A curriculum that allows students to design their own community: mapping out the city, creating the government, and structuring their ideal community through a variety of fun and engaging projects. Geared toward younger students. Learn cooking and business insight from the vibrant food truck scene of Los Angeles! Students in this class get a chance to explore college options, with topics covering everything from the application process, financial aid and planning, picking majors, developing good study habits, and more. These are intensive programs designed to teach social and emotional skills and tools to high school aged youth. Team building, identity and character exploration. Our community garden class is designed to engage students on a multitude of levels: it teaches students about science, ecology and environmental issues, while also serving as a platform to introduce them to notions of wellness and healthy living. Using techniques such as yoga, cardio, tai-chi & meditation, and with an emphasis on nutrition, this workshop explores way to live a healthy, balanced lifestyle, providing students with hands on life tools that they can carry with them beyond their high school years. Sometimes, we just need a little motivation! This is a hands on workshop designed to help teens identify goals, priorities and values. It is designed to help high schoolers life a full, well balanced life by exploring what matters most to them. This is a course modeled on a college level seminar. It is an engaging, thought provoking class that encourages students to consider how advertising, pop culture, and media impact their day-to-day lives. The purpose of this community based, local history class is to introduce Los Angeles residents to the history of the place they call home, with the goal of fostering a better understanding of where we come from, and helping us better define where we are going. For more information, and to get specific information on how Living Histories can work with your site, please contact us.